Perkins Eastman; Moody-Nolan, Inc. - D.C.
Space per pupil: 236 sq.ft. Located just blocks from our nation’s capital, this new high school building provides a high performance learning environment intended to catalyze the renewal of one of our most historic schools. Founded in 1870, Dunbar was the country’s first high school for African-Americans. Its alumni include people of extraordinary accomplishment. However, as documented in Allison Stewart’s 2013 book, First Class, the once great school fell into long decline - thought to have been exacerbated by a Brutalist 1977 school building that had little natural light and poor security – and had become a symbol of the failure of public education in the city. Though with the support of the alumni, now the school, the community, and a new building is recreating itself and is poised to regain its academic prominence in the 21st Century. Accordingly, the challenge to the design team was to create a facility that honors the school’s tremendous history while helping to catalyze an academic transformation that will lead the school and its community into the future. Inspired by tradition and the historic and cherished 1917 building that served the school before its demolition in the 1970s, the new building re-engages the community by establishing an inviting civic presence and by reopening a street, closed by the 1977 building, as a model of sustainable, low impact development. 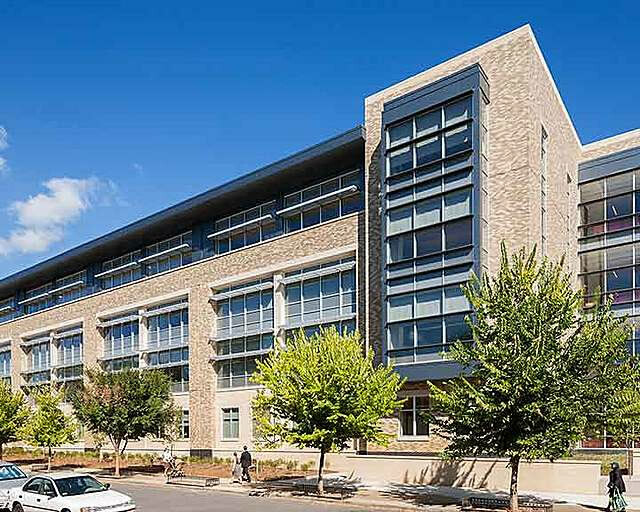 The design also reinterprets the 1917 building’s centrally located armory as the heart of the school situated at the crossroads of all of the building’s diverse programmatic elements. Throughout the public spaces of the new building, the school’s heritage is celebrated through plaques and graphics featuring accomplished alumni and encouraging current students to join their ranks. While metaphorically building on history, the new building is decidedly 21st Century, fostering four academies, including an innovative 9th grade academy and STEM, business, and education/information technology academies. The building is also zoned to encourage active community use. Striving for LEED Platinum, the high performance school features DC’s largest “geothermal” system, a 482 kW photovoltaic array provided through the District’s first Power Purchase Agreement (PPA), two 20,000-gallon cisterns, enhanced acoustics, low VOC materials, and plentiful daylight and views. The building is designed to enhance the educational program in several key s ways. The first is to support the four academies that are the foundation of the school’s restructuring plan. The second is the creation of a cohesive, healthy, and safe learning community. Reducing the scale of the school and fostering stronger relationships between faculty and students, each of the school’s four new academies features its own classrooms, laboratories, administrative and counseling space, and extended learning environments. 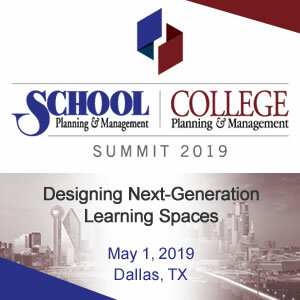 These four small learning communities are stacked vertically to reduce the footprint of the building on the small, urban campus and to ensure that each has a presence on the Armory. Upon arriving from the Armory, a visitor or student is greeted by the leader of the academy, an Assistant Principal whose office overlooks the entry and has sight lines through the entire academy. Also adjacent to the entry is one of the floor’s two extended learning spaces that also serves as a reception area and a teacher workroom conveniently located to encourage teacher interaction. South-facing classrooms in each academy are juxtaposed with north-facing labs that are each specifically designed for the academy’s program. Just outside of the classrooms and labs, benches line the walls providing students a place to sit and linger between classes, encouraging a more collegiate ambiance. 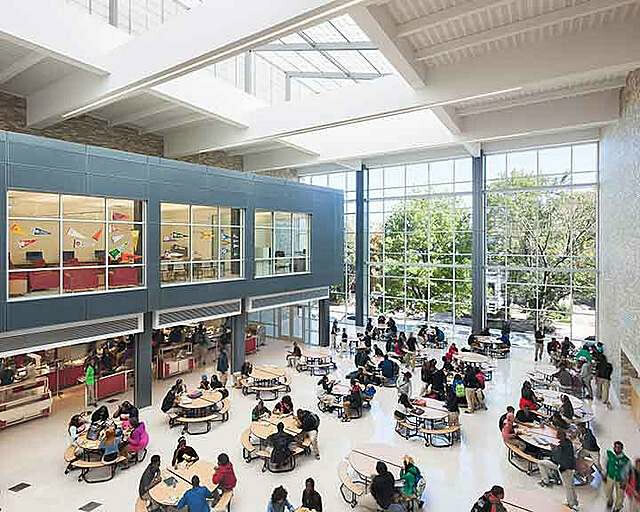 This ambiance is continued outside of the academies within the major public spaces of the building, including the heart of the school, the Armory, with its food court, and the Senior Lounge on its upper level. Like the academies, every major program element in the building, from the gym, pool and theater to the media center, college counseling, administration and school museum, “orbit” the Armory. 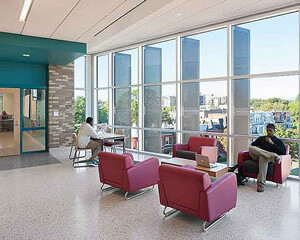 Throughout the building, openness, transparency, and natural light reconnects the school to the community (in contrast to the 1977 building) and connects formal and informal spaces, activating the entire building as a place to learn. This degree of openness and visual engagement reinforces the subtle sense of security within the building enabling all to see and be seen, reducing opportunities for bullying while also frustrating intruder access. Among the goals of the project were to create a truly high performance learning environment that would support the transformation of the school’s academic program, enhance the energy performance of the school relative to the larger DCPS inventory, help mitigate chronic local flooding during storm events, and educate the next generation of environmental stewards. The first goal was achieved by coordinating the many systems that result in a supportive educational environment: natural and electric light, acoustics, thermal comfort, indoor air quality, color, furniture, and space. These priorities drove design from the initial organizational strategies on the site, where the academic wing housing most of the classrooms and labs was oriented east-west, resulting in our ability to more easily control natural light and glare in the north and south facing instructional spaces. 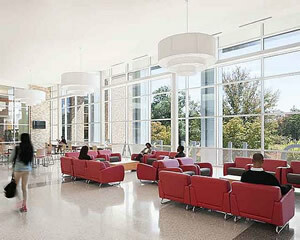 As design developed, a focus on enhanced acoustics – in contrast to the raucous, open plan environment in the Brutalist 1977 building – influenced wall construction, window and door assemblies, floor and ceiling specifications and even the location of ground source heat pumps and other HVAC equipment relative to the instructional space. 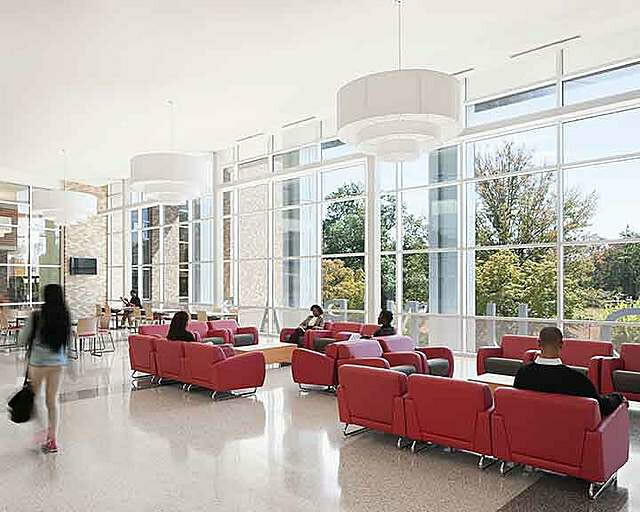 In addition to the building’s pervasive natural light, the building sought to maximize energy performance in innovative ways by integrating as many systems into the “geothermal” system – the largest to date constructed in DC – including the pool and kitchen equipment and the radiant floor system in the “Armory,” the heart of the school. Requiring legislative action by the City Council, the school also features a 482 kW photovoltaic array provided through the District’s first Power Purchase Agreement, clearing the path for subsequent DC projects to make use of this renewable energy precedent. 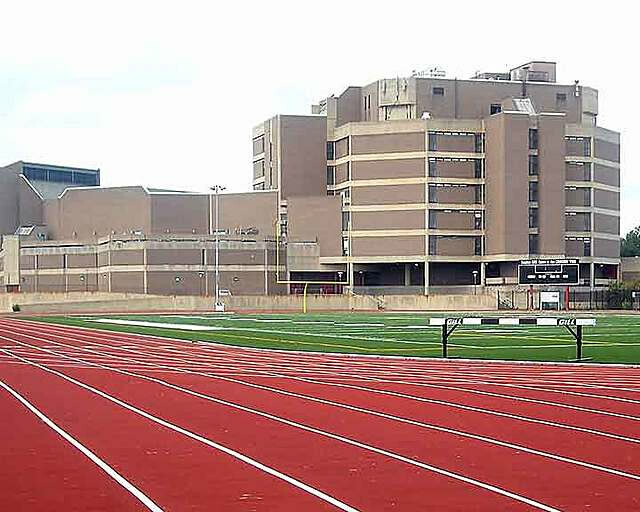 The Department of General Services, in conjunction with Pepco, is monitoring the energy performance of each of their buildings including Dunbar with the goals of optimizing the performance of their portfolio. By reopening a public street right-of-way closed by the 1977 building, the project also helps to reconnect the neighborhood and mitigate chronic storm water issues in the community. Complementing the two 20,000 gallon cisterns receiving water from the building’s roofs, the reopened O Street will feature 6,152 sf of rain gardens arrayed along both sides of its length, able to handle a 1.2 inch storm event, creating a model of low impact development (LID) for the school, the Truxton Circle neighborhood, and the city. Each of these systems comes together within the school’s aspiration to engage the building as a teaching tool. Pre-Engineering classes participated in the design and construction process and are now poised to integrate the building and its systems into their curriculum. The students are also training to lead tours of their LEED Platinum (pending) building, sharing what they have learned with peers and visitors. The school is helping to catalyze the resurgence of the historic Truxton Circle community surrounding the campus. Whereas the 1977 building responded to inner city violence and tensions and the environmental and educational trends of its day by turning inward through an architecture that Mayor Gray, a 1959 graduate of the school, likened to a prison, the new building reengages the community metaphorically, visually, and physically. The openness, transparency, and organization of the new building invite active community use of the “commons” portion of the building, featuring a competition pool, media center, museum, theater and gym organized around an atrium-like “Armory.” Likewise, the new architecture, echoing the towers, bay windows and massing of the much beloved 1917 building demolished in the 1970’s, reasserts the history, heritage, and “civic presence” of the school in the community. Undoubtedly, housing values have risen with the construction of the new building and the demolition of the 1977 building. Stakeholders for the project were invested in the transformation of the school architecturally and academically before the design team and they remained active throughout the process and to this day. Key among these stakeholders were the Dunbar Alumni Federation that represents generations of successful alumni and look forward to their growing ranks. The design and construction process was fast paced, beginning with a design competition and concluding 34 months later when the 280,000 gsf building opened to great fanfare. Throughout the process, a School Improvement Team (SIT) including representatives from the school, the alumni, DCPS, the Department of General Services and the community met regularly with the design and build team to review the design and construction progress, coordinate outreach to the larger stakeholder community, and consider other issues related to the project.